A wonderful emotional journey of a woman's homecoming after several years away. A tragedy years ago had a huge impact on every member of the Holley Family. Each of them dealt with it differently but it seems that Anna took it the hardest. This is a story of Anna facing the past and coming to terms with it as the future seems to be filled with changes. It's a great story with wonderfully descriptive writing. Definitely a book I recommend. What a sweet and cozy Christmas romance! And, seriously, what a gorgeous cover! Anna has social anxiety. Talking to people she knows is especially difficult – she finds it hard to talk, and if she does manage to say something, she stutters. As the third in a vicar’s family of four daughters, all of whom are much more extroverted than her, she’s managed to hide it from her family, but returning to the family home for ten days over Christmas is something she’s both anticipating and dreading. “How she’d managed to disguise her social anxiety as mere shyness for twenty-two years was testament to how chaotic her family life was. It was easy to get lost in the noisy mix, and so often no one noticed she wasn’t speaking at all.” It’s while trying to escape her family that she meets Simon at one of the village pubs, and, under the effects of a couple glasses of cider and the stress of being home, she pours out her heart to him about the gaping hole left in her family by her brother Jamie’s death and her family’s inability to deal with it. Simon is sweet and adorable, though he is no stranger to grief, either. Anna describes him as “the human equivalent of a Golden Retriever,” which both made me laugh and also gave me an immediate idea of what he was like. It’s not until the next day that Anna realizes that the supposed stranger she unloaded on is actually her father’s new curate. (Side note: A curate, for those unused to the Anglican system, is a sort of training position under a vicar. So he’d be someone who’d be working closely with the vicar and receiving guidance from him.) “From the first moment he’d seen her, Simon had wanted to take away that sadness and that was unwise. He couldn’t take away someone’s sadness. He was no one’s rescuer; that much he’d learned, and in the hardest way possible.” Anna is, understandably, even more mortified, though Simon, to his credit, tries to reassure her that her secrets are safe with him. And though Simon wants to fix Anna, he realizes immediately that he can’t. Instead, he tries to help her understand that her feelings around her unresolved grief are normal and human, and encourages her to talk to her family about it. Though their relationship gets off to a rocky start, both realize there’s a spark there, and Anna eventually overcomes her initial hesitance to spend more time with him. Since this is a very short novella, their relationship doesn’t progress very far, and the only sexual content is a few kisses. “It’s never too late, Anna. That’s one of the wonderful tenets of our faith. There’s always time for a fresh start.” As a book centered around the daughters of a vicar during the Christmas season, it’s unsurprising that there’s Christian themes running throughout the story. Unlike some inspirational romances I’ve read before, though, it fits nicely into the story instead of bashing you over the head with Christian-ness, and it only gets mildly preachy, so I don’t think a secular reader would be turned off by it. The theme of brokenness, of being broken beyond repair, is one that I think would resonate with most readers, as well as the theme of confession and its effect of shining a light on the dark places of your soul. “We’re all broken, Anna. That’s the nature of being human. I’m as broken as you are, if not more.” Though Anna believes she is the broken one, the disappointment, in the family, it’s clear that the rest of the Holley family has unresolved issues as well, which leads me into the cons for this novella. Since it’s obviously the first in a series, the setup of the family dynamic and how each of the sisters fit in it took up quite a few pages, leaving less time for Anna and Simon’s developing relationship. Because of this, the ending felt abrupt. None of the issues that came between Anna and Simon were truly resolved, and it felt more like a happily-ever-after-for-now rather than a true happily-ever-after. Overall, though, I gobbled this up in an afternoon. It’s just so sweet and cozy, and it made me long for a walk in the fells with a dog by my side, and then coming home to a pot of hot chocolate and a roaring fire. This is a lovely and light-filled read for the season. I received this book for free from LibraryThing in exchange for an honest review. This does not affect my opinion of the book or the content of my review. A cute Christmas story. Anna thinks of the old adage that you can never go home. She hasn't been home for several years. She loves the village and her family, but doesn't feel part of all of it. After finding out her sister is dating Anna's old crush, she goes to a local pub. There she meets a man and suddenly she is confessing all her secrets. Simon meets a woman in the pub, realizes that she is having problems and wants to help her. After talking awhile, he realizes that he is going to be working with her father. Very awkward. Simon has some old hurts that he is trying to work through also. So, will they be able to help each other? 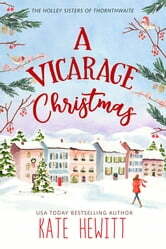 A Vicarage Christmas, is a novella of only 121 pages long and the first in a series of books about the Holley Sisters. In book one we meet Anna Holley, returning to her family home to Thornthwaite, Lake District, for 10 days over Christmas. Anna is one of four daughters of Roger (local vicar), and Ruth Holley. She lives and works in Manchester and doesn’t often return to Thornthwaite. The place makes her feel claustrophobic and relive painful memories of her brother Jamie’s death, when they were children. She also suffers from social anxiety, something that she tries to hide from her family, who are quite full on, and the vicarage is always full of people coming and going. It’s one one of these days when the house is full that Anna feels she needs to get out for a while, where she meets stranger Simon. For some reason Anna opens her heart to him about her life and how she feels. Unfortunately, Simon turns out to be her father’s new Curate. With her social anxiety already taking over her, she feels even more inner turmoil when she realises that she is going to have to spend time with the one person who knows her secrets. Though Simon has had to deal with his own issues in his past he wants to help Anna, but will she let anyone in to help her? Anna is a lovely young woman who has burdened herself with blame for her brother’s death and believes that everyone else feels the same, including her family. It was after his death that she became withdrawn, shy and started stammering. Away from Thronthwaite she feels free as people don’t know her, or her past, so returning to her family home is a big deal for her. Simon is a man with a big heart. He didn’t know who Anna was when she opened up to him, and when he finally made the connection it was too late. He felt awful for putting her in that situation and making her feel more anxious, but he also felt a pull towards her and wants to help her feel less alone. 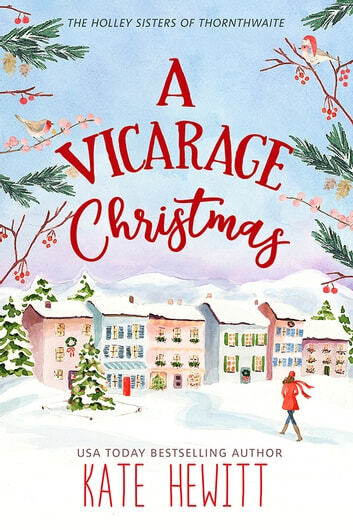 A Vicarage Christmas is a sweet festive read. With it only being quite short the book jumps straight into the story and drags you into the Holley’s lives. The whole family are lovely, though they also all seem to be hiding their own problems from one another. As this book is the first in a series, you know that each secret is going to be revealed over the course of time. I can’t wait to read book two, out in January, as I sat and read Anna’s story in one sitting and I look forward to meeting her other sisters in more depth, and see what the future has in store for Anna too.